Medialuso, a MEDIAPRO group company based in Portugal, worked together with the regional channel in the production of the “Violadores del verso” concert, organized by 3D5 and which took place in Zaragoza on the 10th June. 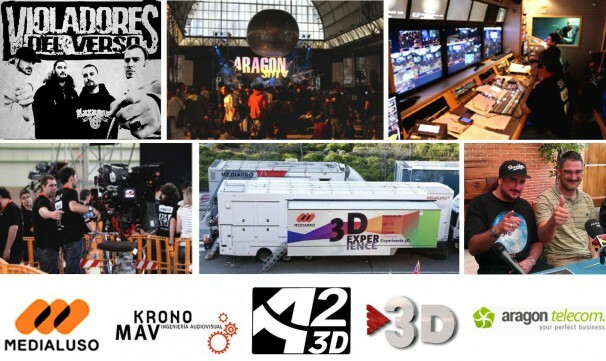 The event was produced live in 3D and 5.1 Dolby E sound using cinema quality broadcast via satellite for movie theatres in Zaragoza, Europe and Latin America and in simulcast for the TV channels which broadcast in 3D such as TV3 and Aragón TV. 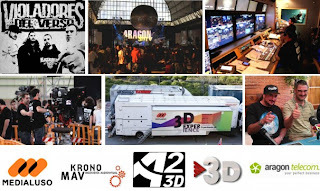 The production featured a Medialuso 3D outside broadcast van equipped with a stereoscopic system from Kronomav, this company also worked in this production, as well as a multi-track sound OB van. Technical equipment used included 10 3D cameras: 1 travelling camera, 1 Jimmy Jib hot-head camera, 1 omnicam, 1 polecam, 2 rigs side-by-side, 2 over-under rigs and 2 mini-cams. “Violadores del verso” is one of Spain’s leading rap bands and their latest record, which featured heavily in the concert, is “Vivir para contarlo”. The album’s title was a suitable description of the concert which allowed viewers to lose themselves in the music even though they were thousands of miles away from the concert location in Torre del Agua in the Expo buildings.